So, lashing a backpack or duffel on the tramp just behind the mast on a Sol Cat 18 is a real pain. It creates real problems with controlling the jib sheets and traveler controls. I've read a bit about how some folks lash gear under the tramp, in the middle of the tramp, store it in hulls, tow a raft behind them etc and none are overly appealing to me. I realize that storing gear isn't always necessary, but, i thought that perhaps a storage system similar to a large raft would be doable. Say, a second beam the width of a cooler/storage bin ahead of the mast, and then using straps to suspend and secure it. This way the load could be centered and balanced as close to the mast as possible. I realize putting more holes in the hulls probably isn't a great idea, and that having weight ahead of the mast probably isn't a good idea... anyone tried this or have any input? Appreciate anything you can send my way, thanks! Some ideas in there. Mine is the first group of photos with the red netting. I don't use it anymore now that I got a second boat. When we go on a camping trip we can split the gear on 2 boats. The others are a little more in depth but if you just take a length of pvc and tie together some paracord into a net or just get some premade stuff its pretty effective and didnt make the front of the boat noticeably heavier even with 100lbs of camping gear up there. I made some wooden risers to raise the beam up a little to keep the gear out of the water after the net started sagging a bit. had declined to purchase. It was a nice surprise but thought it useless until we tried it out. Check out the link for a few pictures that I posted years back. We have used this bag on the Prindle, Hobie 18, and now currently on the Nacra 6.0 when we sail out for a long day. It holds quite a bit and as you can imagine the more weight it has in it the lower it will sag and will drag in the heavy chop. 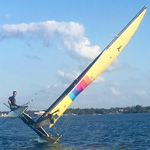 It sits pretty high on the Nacra so will handle large waves without taking too much of a beating. It has a dual pull full length zipper so it is easily accessed from the tramp. and lunch, and clothing in a dry bag. Pete, who made this bag? Sounds like a good solution for clutter. Quote I've read a bit about how some folks lash gear under the tramp, in the middle of the tramp, store it in hulls, tow a raft behind them etc and none are overly appealing to me. i own a jon boat and tried it .. towed it with a 50' line .. was ok except when in a channel - worried it would hit and wrap around a marker - decided it wasn't worth it. my 6.0 has a web triangle that goes from beams to furler. it is perfect for my anchor and maybe a dry bag.